Enjoy Mix is a celebration of nuts and kernels from all over the world. The Enjoy Mix is lightly salted and ready to enjoy! vegetable oil, salt, corn starch, wheat flour, sugar, maltodextrine, sesame, flavorings (taste enhancer [E621] whey powder) antioxidants (citric acid, E319). Allergy information: This bag may contain traces of other nuts. Storage: Keep this product in a dry and dark place at room temperature. Warning: Keep away from small children. They can choke on nuts! Mind the environment: Please sort as plastic. Best before: See the bottom of the bag. Nuts and Кernels from all over the world, seasoned with selected spices. Great with drinks, great with friends! 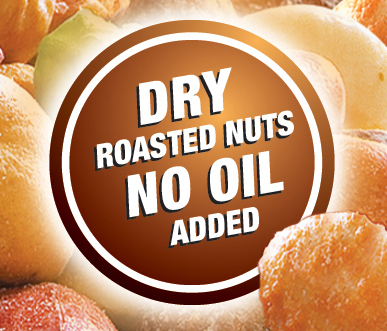 A mix of natural and lightly roasted, non-salted nuts and kernels from all over the world. Great as snack food, breakfast cereals or cooking. 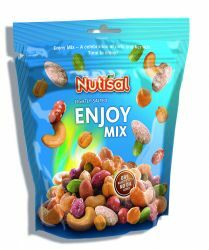 A sweet and salty mix of nuts and dried fruits. Great as an energizing snack in between, or as breakfast cereals. A tasty mix of Nuts & Kernels. guaranteed to retain their full original taste. Enjoy Cashews is a delicious collection of our best cashews. They are just lighty salted and ready to enjoy. A mix of natural, non-salted nuts and kernels from all over the world.